Exeter are struggling and do not play well enough to get good results against the top teams whilst Sheffield Wednesday are 2nd in the league, playing well and when they play the bottom clubs normally win and I think they will be too strong this weekend.Concerning matches played at home against the top 6 this season Exeter City has collected 0.25 points on average in 4 matches. 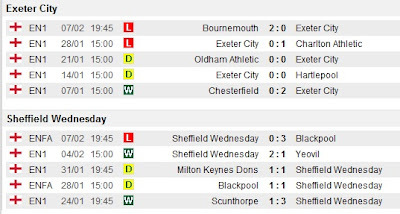 When looking at matches played away against the bottom 6 this season Sheffield Wednesday has collected 2.63 points on average in 8 matches. *** Join our online slot mania at 12BET; get huge bonuses and a possible free spins! Indulge in the Valentine day promo and be our biggest slot winners this month! For more information about our Valentine promotion, visit us at www.12bet.com.